What could Blizzard add to World of Warcraft that could be a feature which you could utterly sink into, or utterly disregard? Something that could add value to the game for some players, while not being compulsory at all? Something like Pet Battles or transmogrification in terms of impact, something with a lot of depth and breadth, that you could make part of your game experience or just ignore completely? One of the things I absolutely love about Pet Battles is how I have never once participated in them, and it hasn’t had the slightest effect on my game whatsoever. Yet I’ve watched others play them, strategize them, and work out the absolute best way to participate in them. It’s astonishing how much creativity and effort people put into it. Similarly, a lot of players could care less about transmog. They wear the gear they have and they’re fine with that. I used to believe I was one of those players, until I realized I had a collection of weapons in the bank that I was never going to use, except now I could. The next thing I knew my mania had erupted forth in a mad drive to collect every single useful appearance I could get my hands on. I ran out of bag space, had to make hard choices about what to keep and what to throw away. Now in Legion, that barrier to my collection is gone and I’m blazing through every old raid I can get my hands on with every character I have. So I find myself wondering — what could they possibly do next? What could possibly be the next “I must do this even though it in no way makes me stronger” feature for WoW? Would it be true, customizable player housing? 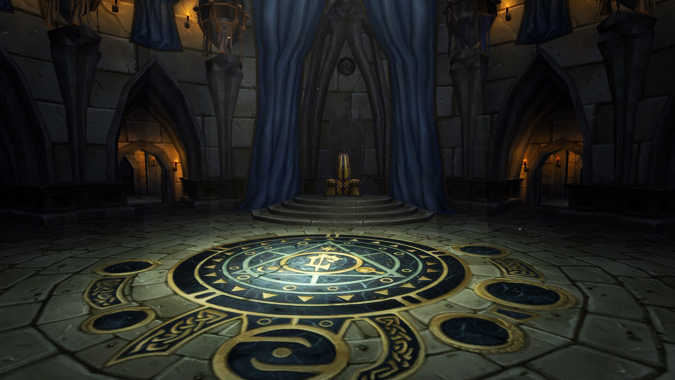 Will we all be running old raids to get the throne that Nefarian sits on, or Blackrock Depths for the furniture in the bar? Or will it be something else that I haven’t ever thought of because you’re all a clever bunch?